Jacques Villeglé has been making what he calls ‘décollages’ for over 50 years now – so-called because, unlike paper collage, his is a process of ‘un-sticking’, of tearing away. 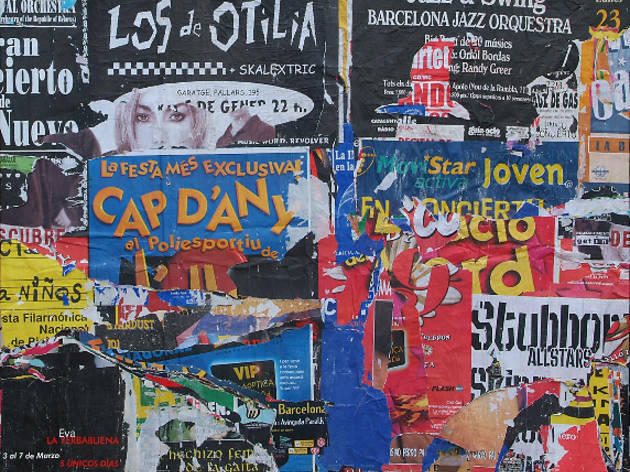 Specifically, it’s the tearing away of layer upon layer of fly-posters – whole expanses of which Villeglé simply lifts from urban billboard sites, and then mounts and frames. Hence, too, his association with the ‘Nouveau Realisme’ movement – for what could be more realistic than reality, than actual examples of the sorts of commercial images that surround us everyday? 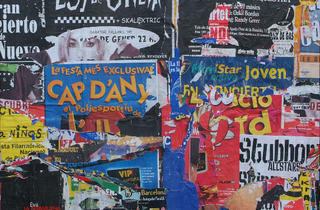 Yet his use of advertising imagery also reflects upon a kind of fantasy world, a probing of the collective subconscious. In the large-scale works exhibited here, drawn from the past decade or so, the posters mostly relate to musical events – album releases, concerts, etc. What you get, then, as the various different strata are revealed in great, ragged fragments, is a kind of archaeology of visual styles and connotations: the black-and-white chequerboarding of ska overlaid by the jagged lettering of heavy metal hemmed by DIY print-jobs on day-glo paper. Taken together, they evoke the frenzied cacophony of urban experience – the constant, desperate clamour for attention. The single most astonishing work, though, dates from the late ’70s, and focuses on a single poster image of a young boy’s face, where the entire eye-area has been cut neatly and squarely away to reveal torn, wadded layers beneath, and on top of which the crude outline of an eye has been redrawn. It’s an extremely disturbing effect – the whiteness of the torn paper making the boy’s eye appear blank and sightless, even as it seems to peer, like through a window, into a world beyond his own.